Samuel L Jackson has made a career over the last few years out of cameo’s in Marvels comic book movies. He was rumoured to have been signed for a nine movie contract leading up to his own Nick Fury movie. Although his part in Iron Man 2 has been made a little bigger than the 30 second clip after the credits for the IM2. He will however be replaced apparently with Captain America and the Might Thor. Captain America has only recently been cast as the former Johnny Storm from the Fantastic Four, none other than Chris Evans who will also star in the soon to be released “Losers” also based on a comic book, Thor will be played by Chris Hemsworth from Star Trek. Stan Lee will also probably keep his cameo in the movie as he manages to sneak on all the movie sets since Spider-man and X-Men. 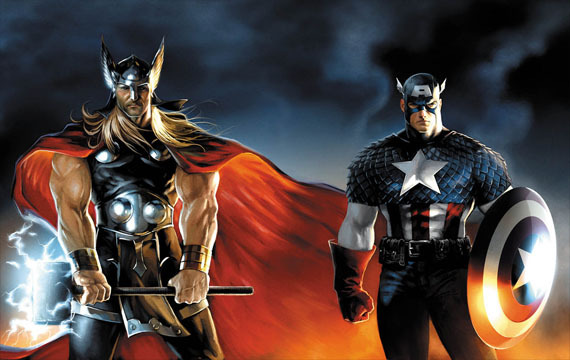 It all brings us one step closer to The Avengers movie due for release in 2012.